HETS has joined the Puerto Rican Distance Education Association (APAD, by its Spanish Acronym) for the coordination of the Distance Education Conference ?Construyendo la Nueva Agenda de la Educación a Distancia? 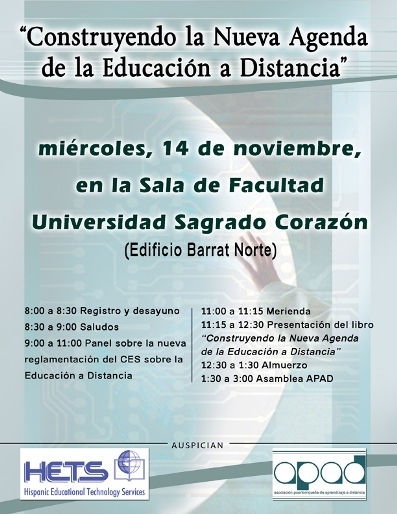 (Constructing the New Agenda of Distance Education), to take place on November 14, 2007 at the University of the Sacred Heart in Santurce, during APAD’s Assembly. During this event, a panel of experts will be analyzing the new Distance Education guidelines of the Higher Education Council of Puerto Rico (CES, by its Spanish Acronym). This activity will give place, as well, to the presentation of the book ?La Nueva Agenda de la Educación a Distancia?. This publication includes collaborations from Dr. Juan Meléndez, Prof. Ana del Castro, Dr. José Sánchez, Dr. Antonio Vantaggiato y Prof. Carmen Betancourt. The editor of the book, Marta Mena, will be joining through videoconference from Argentina. For more information or to make a reservation, please contact Heisha Romero through heromero@suagm.edu or call (787) 766-2600, extensions 8910 and 8911.